MEMBERS OF Ramallah’s El Funoun Dance Troupe, who work in refugee camps, villages, and cities throughout Palestine, will perform at the fourth Galway Dance Days festival. The festival, entitled Corp_Real Bodies in Conflict festival, runs from Friday March 27 to Sunday 29, and features performances, installations, talks and workshops. Organised by Galway dance artist in residence Ríonach Ní Néill, all events take place at Bailey Allen Hall, NUI Galway, unless otherwise stated. The festival opens on Friday 27 with a series of talks in the Black Box Theatre, starting at 1pm with Conflict Without Conflict Within, looking at racism, imagination, and collaborative action with Dr Finola Cronin; artist Fiona Delaney and members of the Tower Migrant Reception Centre Sewing Club, Dublin; dance artist Aisling McCormick and Mícheal Chandra, Barefoot Performance Company, Zambia; performance by John Scott, Irish Modern Dance Theatre & Centre for Survivors of Torture. The Conflict of Practice at 3pm features dancer Ella Clarke on choreographing extreme violence for theatre; Dr Mark Hamilton on performance as means of cultural emancipation; and artist Jessica Kelly. In Violence of Inscriptions: On the Bodies of Conflict at 4.30pm, German dance curator Sandra Noeth and Lebanese performance artist Rima Najdi will examine what kind of bodies are produced by conflict. Saturday 28 begins with the Making Connection workshop at 10am led by dance movement therapist and choreographer Bernadette Divilly. Resilience, Resistance, Resolution at 12 noon will hear Peruvian human rights lawyer Patty Abozaglo, and NUI Maynooth’s Dr Karen Till, look at dance-making and performance in conflict and post-conflict situations in Colombia and Peru. The Choreography of Resolution: Dancing Social Resilience workshop at 1.30pm will see Michelle LeBaron (University of British Columbia, Canada ), Carrie MacLeod (European Graduate School, Switzerland ) explore how dance and somatic intelligence can be applied in diverse conflicts and contexts. Regan O’Brien and Astrid Walsh’s A Countable Transparency is a performance installation which invites the spectators to navigate its unpredictable landscape and engage with it, through touch and movement. On Sunday 29 Prof Gerry Kearns (NUI Maynooth ) examines South African visual and performance art in The Post-Colonial Body at 1.15pm. The Troubles and post-conflict Northern Ireland is the focus of The Force of the Turning, with dance artists Dylan Quinn and Mags Byrne, Beatrice Jarvis, Dr Victoria Durrer (Queens University Belfast ), with Dr Aoife McGrath. On Friday 27 at 8pm in the Black Box, there will be a show from Compagnie Nacera Belaza, led by the acclaimed Algerian dancer and choregorapher Nacera Belaza. Saturady 28 sees Andrew Duggan and Siamsa Tíre The National Folk Theatre giving a public performance from NUI Galway to Shop Street from 4pm. CACTUS p.a.c, a Palestinian/Brazilian/Greek production sees two women play a series of poeweer games through light, sound, and movement, in The Cube, NUIG, at 8pm.On Sunday 29, Bernadette Divilly will lead the Walking Wisdom performance at 4pm from Woodquay. Mags Byrne of DU Dance (Northern Ireland ), which advocates dance as a means for personal and social development, will reflect on the company’s performance projects, Exile, and Yante, I Can Move, with young Palestinians. Ríonach Ní Néill will also contribute. El Funoun will give a professional dance workshop from 10am to 12.45pm on Sunday. 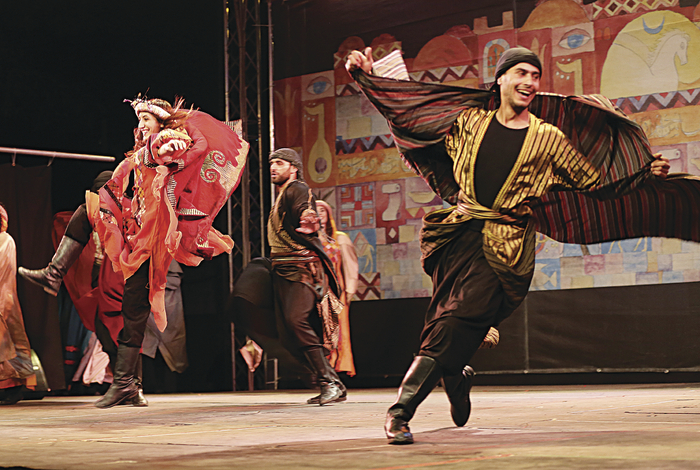 Their style is rooted in traditional Palestinian dance and culture, with international influences. They will hold a free outdoor dance session at 3pm in Eyre Square. The event is for all ages and all are welcome. Booking is through the Town Hall Theatre (www.tht.ie or 091 - 569777 ). A three day Festival pass is €50/40, a one day pass is €20/18. Individual performances are €16/13.